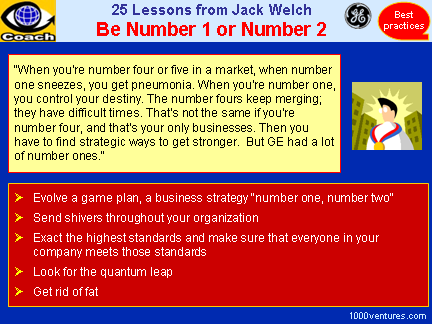 "When you're number four or five in a market, when number one sneezes, you get pneumonia. When you're number one, you control your destiny. The number fours keep merging; they have difficult times. That's not the same if you're number four, and that's your only businesses. Then you have to find strategic ways to get stronger. But GE had a lot of number ones." Evolve a game plan, a business strategy "number one, number two"
Build on what the company does best. Have a Unique Selling Proposition based on giving customers value that competitors cannot equal or surpass. Become more concrete, more focused. In business, the strong survive, the weak do not. The big, fast ones get to play, the small, slow ones are left behind. There is a competitive advantage of being the best – or the second best – that can, and should, be exploited. Winners and market leaders will be those who insist upon being the number one or number two fastest, → leanest, lower-cost, world-wide producers of quality goods or services and those who have a clear technological edge or a clear competitive advantage in their chosen niche. Don't keep your number one, number two strategy a tightly held secret keeping everyone guessing about your intentions. Make it clear to everybody that your company has a purpose and focus and is determined to become a most competitive enterprise. Shake things up, force your leaders to look at their businesses anew, giving them a challenge to grapple with: the challenge of staying number one or number two under constantly changing competitive conditions. Set the bar a bit higher. It is healthy. It is invigorating. Exact the highest standards and make sure that everyone in your company meets those standards. Mediocre players will eventually lose out. Don't benchmark yourself against your direct competitors - target much higher. If your returns are nine and your competitor's seven, you are doing well. But can't you get fifteen? Make surprise moves – shock your rivals. Shake things up while other look on from the sidelines, sitting idly by while you knock your competitors for a loop. The three critical ingredients of the quantum leap are surprise, boldness, and shock. There is no real virtue in simply looking for a fight. If you are in a fight – that is , in a competitive battle to dominate the marketplace – your job is to win. If you cannot win, it is best to find out a way out, to jettison your weak business so you could live to fight another day. Focus on your core strengths, and get rid of weak businesses that slow you down. Create a synergistic combination of star businesses.